A wreath is a circular head ornament in the form of stylized or natural leaves most often of laurel, oak, olive, or ivy leaves. In ancient times, wreaths made of gold, silver, gold-plated metal or gilded wood, were used for a variety of purposes. They were worn in religious ceremonies or placed in graves as symbolic offerings. Wreaths made of stylized or natural laurel leaves, representing victory and achievement, were given to honor military achievements or to victors at the original Olympic games. Gold wreaths were also worn as crowns by Etruscan rulers and Roman Emperors. 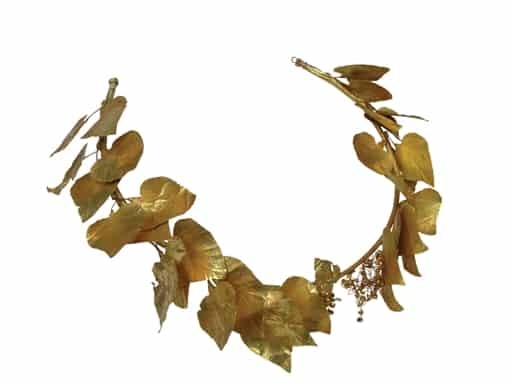 Hellenistic Gold Wreath, Circa 350-300 BC. Photo Courtesy of National Archaeological Museum of Greece.